Manufacturers added 24,000 workers in April, the seventh consecutive month with robust hiring growth in the sector, averaging 26,571 per month over that time frame. As such, the latest jobs numbers confirm that the labor market has tightened significantly, with manufacturers increasing employment by a rather strong 19,000 per month on average since the end of 2016. Since the end of the Great Recession, manufacturing employment has risen by 1,202,000 workers, with 12,655,000 employees in the sector in this report. That is the highest level of manufacturing employment since December 2008. More importantly, healthy jobs growth is also leading to higher wages. Average weekly earnings for production and nonsupervisory employees in the manufacturing sector rose to $907.78, up 4.2 percent over the past 12 months. Despite the healthy increase in manufacturing employment, nonfarm payrolls increased just 164,000 in April. While this represented an improvement from the gain of 135,000 in March, it was below the consensus estimate of around 190,000. Meanwhile, the unemployment rate dropped to 3.9 percent in April and continued to be the lowest level since December 2000. In addition, the so-called “real” unemployment rate, which includes discouraged, other “marginally attached” workers, fell from 8.0 percent to 7.8 percent, the lowest level since July 2001. Other measures on manufacturing activity were also heartening, with continued growth and a solid economic outlook. The ISM Manufacturing Purchasing Managers’ Index declined to 57.3 in April, the lowest level since July 2017, but even with softer growth in production, exports and hiring, the latest survey remained consistent with healthy expansions in the sector. Along those lines, new orders were robust, with that measure at 60 or higher—a threshold suggesting very strong growth—for 12 straight months. The sample comments tend to echo that finding, with respondents noting healthy growth in activity and a promising outlook, even as they cite some trade worries. At the same time, manufacturers report accelerated input costs, with the data on raw material prices at levels not seen in seven years. There were similarly encouraging findings in the latest manufacturing survey from the Dallas Federal Reserve Bank and in the most recent factory orders data. Improved international economic growth has also helped, with exports building in the early months of 2018 on the rebound in global demand in 2017. U.S.-manufactured goods exports totaled $280.56 billion through the first three months of 2018, up 6.34 percent from the year-to-date total of $263.83 billion in 2017. In addition, the U.S. trade deficit fell back to earth in March after soaring to the highest level since October 2008 in the prior release. The trade deficit declined from $57.74 billion in February to $48.96 billion in March—a six-month low. More importantly, goods exports rose to a new all-time high, up to $140.88 billion. With that said, it is worth noting that the U.S. dollar has risen 3.4 percent since January 25 against major currencies, according to the Federal Reserve. Still, the dollar remains 8.6 percent lower than it was at the end of 2016, helping the overall competitiveness of U.S. exports. As noted earlier, manufacturers continue to report a pickup in pricing pressures. Indeed, the personal consumption expenditures (PCEs) deflator has risen 2.0 percent over the past 12 months, the fastest year-over-year pace since February 2017. Excluding food and energy, core PCE inflation rose 1.9 percent year-over-year in March, accelerating for the seventh consecutive month after bottoming out at 1.3 percent in August. At the conclusion of its May 1–2 meeting, the Federal Open Market Committee (FOMC) acknowledged that inflation had approached the committee’s 2-percent goal, but as expected, participants chose not to raise short-term rates. The Federal Reserve did note continued strength in the U.S. economy, especially in the labor market, and the FOMC is widely expected to hike the federal funds rate again at its June 12–13 meeting for the second time so far this year. Given the healthy gains in manufacturing employment described above, the latest Job Openings and Labor Turnover Survey report will be one of the highlights this week. In February, there were 426,000 job postings in the sector, with hiring at the highest level since November 2007. Indeed, manufacturers continue to cite their inability to attract and retain quality workers as the primary challenge for their business, according to the most recent NAM survey. There will also be additional data on inflation, with updates on consumer and producer prices. Other releases out this week include new figures on consumer credit, consumer sentiment and small business optimism. ADP reported that manufacturers added 10,000 workers in April, easing somewhat but extending the 18,000 gain in March. 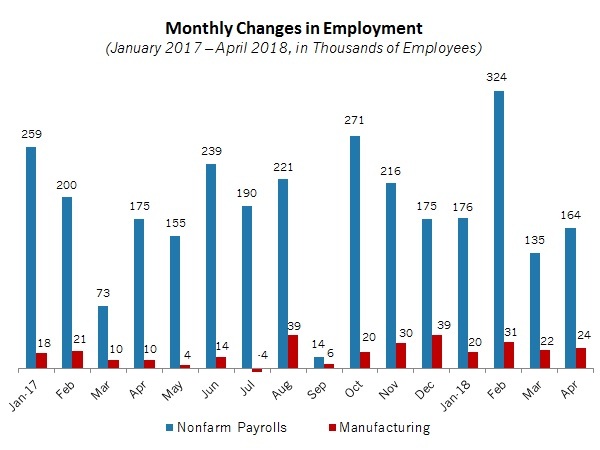 Through the first four months of 2018, the manufacturing sector has hired an additional 17,942 employees per month, up from an average of 14,823 per month for all of 2017. The data show strong growth in hiring activity since the end of 2016, especially as production and the overall economic outlook have improved. In contrast, manufacturing employment was more sluggish in 2016, illustrating the turnaround in the labor market since then. More importantly, continued strength in job growth is expected moving forward. Meanwhile, total nonfarm private employment increased by 204,000 in April, off from 228,000 in March. Nonetheless, it was the fifth consecutive month with job growth of at least 200,000 in the U.S. economy, according to ADP’s estimates. Over the past four months, nonfarm payrolls have risen by 228,542 workers per month, up from an average of 185,415 per month for all of 2017. This is yet another indication that the U.S. labor market remains quite robust. In April, the largest employment growth included professional and business services (up 58,000), education and health services (up 39,000), leisure and hospitality (up 36,000), construction (up 27,000) and trade, transportation and utilities (up 14,000). Small and medium-sized businesses (i.e., those with fewer than 500 employees) accounted for 73.5 percent of the net job growth for the month. The Bureau of Labor Statistics reported that manufacturers added 24,000 workers in April, extending the 22,000 gain in March. It was the seventh consecutive month with robust hiring growth in the sector, averaging 26,571 per month over that time frame. As such, the latest jobs numbers confirm that the labor market has tightened significantly, with manufacturers increasing employment by a rather strong 19,000 per month on average since the end of 2016. That is quite a turnaround from the sluggish job growth in 2016, and it is a sign that firms have continued to accelerate their hiring as the economic outlook has strengthened and demand and production have improved considerably. The latest report is very encouraging. Strong job growth in April shows that economic confidence remains high in the wake of historic, pro-growth tax reform. Moreover, manufacturers continue to invest, raise wages and hire more workers as they expand their businesses and plan for the future. Congress and the president delivered on their promises, and now manufacturers, through our “Keeping Our Promise” campaign, are showing how we are delivering on ours. Along those lines, average weekly earnings for production and nonsupervisory employees in the manufacturing sector rose from $901.39 in March to $907.78 in April. That translated into a whopping 4.2 percent increase over the past 12 months, up from $871.10 in April 2017, which further illustrates the strength of the labor market right now. The Census Bureau reported that private manufacturing construction spending slipped for the second straight month, down 1.1 percent in March after decreasing 0.9 percent in February. The value of construction put in place in the sector rose to $67.73 billion at the annual rate in January, the fastest pace since May 2017, but it eased to $67.14 billion in February and $66.38 billion in March. Overall, construction in the sector has drifted lower since achieving the all-time high of $82.13 billion in May 2015. Along those lines, manufacturing construction has declined 6.9 percent year-over-year. Even with some recent softness, construction activity should accelerate in the coming months with the solid economic outlook and robust growth in demand, production and hiring. Overall, private nonresidential construction spending declined 0.4 percent in March, but with year-over-year growth of a modest 2.2 percent. In the latest figures, the data showed mixed results. There were more dollars spent on construction projects in the amusement and recreation (up 4.5 percent), religious (up 3.5 percent), communications (up 1.6 percent), office (up 1.1 percent) and educational (up 0.9 percent) segments, among others. In addition to manufacturing, the other major sectors with decreased construction spending in March included health care (down 3.5 percent), commercial (down 2.2 percent) and lodging (down 0.4 percent). Meanwhile, private residential construction spending fell 3.5 percent in March, but with 5.3 percent growth over the past 12 months. In the latest data, single-family and multifamily construction declined 0.4 percent and 2.7 percent in March, respectively. More encouragingly, single-family activity jumped 9.7 percent year-over-year. In addition to those components, public construction spending was flat in March, with a gain of 3.0 percent over the past year. The Dallas Federal Reserve Bank reported that manufacturing activity continued to expand solidly in April. The composite index of general business conditions declined from 22.8 in March to 21.8 in April, but growth remained strong overall. In fact, most of the key measures of activity accelerated in the latest survey, including new orders (up from 10.3 to 27.9), production (up from 14.4 to 25.3), capacity utilization (up from 11.1 to 18.7), shipments (up from 10.3 to 19.3), employment (up from 11.7 to 17.8), hours worked (up from 10.2 to 14.3) and capital expenditures (up from 18.2 to 23.9). At the same time, the strong economy has lifted both wages and benefits (up from 24.1 to 29.3) and prices for raw materials (up from 43.0 to 46.3). Input costs in April grew at the fastest pace in seven years, mirroring the rise in other data. This trend is seen continuing over the next six months as well, with 53.7 percent of respondents predicting higher costs and just 4.6 percent anticipating declines. Meanwhile, manufacturers in the Dallas Federal Reserve’s district continued to be very positive in their overall outlook for the next six months. The forward-looking measure inched up from 31.6 to 31.9, which remained encouraging. More than half of respondents anticipate new orders, production, capacity utilization and shipments increasing over the next six months, with 41.3 percent and 39.1 percent planning to hire more workers and spend more on capital investments, respectively. The Census Bureau reported that new factory orders rose 1.6 percent for the second straight month in March. Strong nondefense aircraft and parts orders helped boost the data in both February and March, and in the latest data, that segment jumped 44.5 percent. Aircraft sales are highly volatile from month to month, however, with orders often bunched around key events. Excluding transportation equipment, new orders for manufactured goods increased 0.3 percent in March. Overall, new factory orders have trended sharply higher over the past year. Along those lines, sales of manufactured goods soared 8.1 percent since March 2017, or 6.6 percent with transportation equipment excluded. Nonetheless, core capital goods—or nondefense capital goods excluding aircraft—fell 0.4 percent in March. These can often be seen as a proxy for capital spending in the U.S. economy, and as such, the data suggest that capital investments might have been softer in March than we might prefer. Encouragingly, much like the headline number, there was a healthy gain of 6.8 percent over the past 12 months. Durable goods demand increased 2.6 percent in March, but excluding transportation equipment, new orders edged up just 0.1 percent. At the same time, sales of nondurable goods increased 0.5 percent in March. Looking specifically at durable goods activity in March, new orders strengthened for primary metals (up 2.1 percent), computers and electronic products (up 1.0 percent), electrical equipment, appliances and components (up 0.6 percent) and fabricated metal products (up 0.3 percent). In contrast, sales decreased for machinery (down 1.9 percent), furniture and related products (down 1.5 percent) and motor vehicles and parts (down 1.0 percent). Meanwhile, shipments of manufactured goods rose 0.4 percent in March, with durable and nondurable goods shipments increasing 0.4 percent and 0.5 percent, respectively. On a year-over-year basis, factory shipments have risen 6.8 percent since March 2017, or 6.6 percent with transportation equipment excluded. Core capital goods shipments pulled back 0.1 percent from February’s all-time high, but with year-over-year growth of 7.6 percent. The Bureau of Economic Analysis and the Census Bureau reported that the U.S. trade deficit fell back to earth in March after soaring to the highest level since October 2008 in the prior release. The trade deficit declined from $57.74 billion in February to $48.96 billion in March—a six-month low. More importantly, goods exports rose to a new all-time high, up from $137.13 billion to $140.88 billion. Also helping to push the trade deficit lower, goods imports dropped from $214.09 billion to $210.37 billion. In addition, the service-sector trade surplus rose from $19.21 billion to $20.54 billion. More importantly for manufacturers, exports have started 2018 on a positive note, extending the nice rebound in 2017. U.S.-manufactured goods exports totaled $280.56 billion through the first three months of 2018, up 6.34 percent from the year-to-date total of $263.83 billion in 2017. In addition, U.S.-manufactured goods to our top six trading partners were also better year-to-date this year relative to last year: Canada (up from $66.96 billion to $73.19 billion), Mexico (up from $58.70 billion to $63.93 billion), China (up from $29.50 billion to $32.02 billion), Japan (up from $16.03 billion to $17.46 billion), the United Kingdom (up from $13.08 billion to $17.18 billion) and Germany (up from $12.95 billion to $14.76 billion). Digging deeper into the latest release, goods exports mostly increased, as noted above, led by gains in nonautomotive capital goods (up $1.90 billion), foods, feeds and beverages (up $1.05 billion) and industrial supplies and materials (up $947 million). At the same time, goods imports fell across the board, including declines for nonautomotive capital goods (down $1.51 billion), consumer goods (down $928 million) and industrial supplies and materials (down $704 million), among others. The Institute for Supply Management (ISM) reported that manufacturing activity continued to expand modestly in April, even as it pulled back for the second straight month from February’s best reading since May 2004. The ISM Manufacturing Purchasing Managers’ Index declined from 60.8 in February, to 59.3 in March, to 57.3 in April, the lowest level since July 2017. Softer growth in production (down from 61.0 to 57.2), exports (down from 58.7 to 57.7) and employment (down from 57.3 to 54.2) help to explain the weaker headline number in April. The exports figure eased for the second consecutive month, down from the February rate, which had been the fastest since April 2011. Despite some weakening in other measures, new orders decelerated slightly but remained robust overall (down from 61.9 to 61.2), which was encouraging. To illustrate just how strong demand has been in the manufacturing sector, it was the 12th straight month with the new orders index at 60 or higher—a threshold suggesting robust sales growth. The sample comments tend to echo that finding, with respondents noting healthy growth in activity and a promising outlook, even as they cite some trade worries. With ever-stronger economic growth, manufacturers report accelerated input costs. Indeed, prices for raw materials remained highly elevated (up from 78.1 to 79.3), with the measure at a level not seen in seven years. More than 61 percent of manufacturing respondents said their costs had risen in April, with just 2.6 percent suggesting they decreased. This reflects a rebound in some commodity costs, even as overall pricing pressures continue to be largely modest, at least for now. In other news, inventories expanded in April for the fourth straight month (down from 55.5 to 52.9), even as the pace of growth slowed from February’s near eight-year high. More than anything, the recent growth in inventories is consistent with the healthy growth in overall production. The Bureau of Economic Analysis reported that personal spending rebounded, up 0.4 percent in March after being unchanged in February. Americans consumed more durable goods in March, up 0.8 percent, but they bought fewer nondurable goods, which fell 0.2 percent for the month. Strong motor vehicle sales helped to boost the durable goods numbers. Overall, consumer spending remained a bright spot in the economy, with personal consumption expenditures (PCEs) up 4.4 percent over the past 12 months, down slightly from 4.5 percent year-over-year in the prior report. In addition, goods spending for durable and nondurable goods also increased at very healthy rates over the past 12 months, up 3.9 percent and 4.1 percent year-over-year, respectively. At the same time, personal income rose 0.3 percent for the second straight month in March. Since March 2017, personal incomes have risen 3.6 percent. As such, income growth has remained at modest levels. For manufacturers, total wages and salaries slipped from $869.9 billion in February to $857.6 billion in March. Despite some easing, manufacturing wages and salaries have increased by a solid 3.8 percent rate year-over-year, up from $826.3 billion in March 2017. The saving rate had fallen to 2.4 percent in December—the lowest rate since September 2005—but it has ticked higher since then. With more spending in the latest report, the saving rate dropped from 3.3 percent in February to 3.1 percent in March. One year ago, the saving rate registered 3.9 percent, illustrating an increased willingness to spend over the past 12 months. In other news, the PCE deflator was unchanged in March, pulling back from a gain of 0.2 percent in February. The drag on the PCE deflator in March stemmed largely from energy costs, which decreased 2.8 percent. Core inflation, which excludes food and energy, increased 0.2 percent in March. More importantly, the PCE deflator has risen 2.0 percent over the past 12 months, up from 1.7 percent in the previous report and the fastest year-over-year pace since February 2017. Excluding food and energy, core PCE inflation rose 1.9 percent year-over-year in March, accelerating for the seventh consecutive month after bottoming out at 1.3 percent in August. This mirrors the recent pickup in other price measures, and since this is the Federal Reserve’s preferred measure of inflation, its appreciation will get a lot of attention. The Bureau of Labor Statistics reported that manufacturing labor productivity rose 0.5 percent in the first quarter, easing from the solid rebound of 4.5 percent in the fourth quarter. More importantly, it was the second straight quarterly increase in output per worker following a significant amount of choppiness over the past few years. Manufacturing output increased 3.3 percent in the first quarter, led by strong growth in durable goods, which had output growth soar by 5.5 percent. Nondurable goods output increased a more modest 1.1 percent. Overall, hours worked in the sector rose 2.8 percent, with unit labor costs up 2.7 percent. Durable and nondurable goods labor productivity increased 1.3 percent and 0.6 percent in the first quarter, respectively. The latest release featured revisions to the historical data. In 2017, manufacturing labor productivity increased 0.4 percent, down from the prior estimate of 0.6 percent. Output and unit labor costs rose 1.5 percent and 1.1 percent in 2017, respectively. The annual figure for manufacturing labor productivity growth was slightly better than the average from 2013 to 2017, which registered just 0.2 percent. Indeed, sluggish productivity growth continues to be one of the larger frustrations in the U.S. economy in the aftermath of the Great Recession. In comparison, the average growth rate for manufacturing labor productivity registered 3.9 percent in both the 1990–2000 and 2002–2008 time frames, or the two prior economic recoveries. Meanwhile, nonfarm labor productivity rose 0.7 percent in the first quarter, up from the 0.3 percent increase in the fourth quarter. Nonfarm output decelerated from 3.7 percent growth in the fourth quarter to 2.8 percent in the first quarter, but that was still a decent figure. Hourly compensation costs jumped 3.4 percent in the first quarter, with unit labor costs up 2.7 percent. Similar to the manufacturing data described above, nonfarm labor productivity has slowed considerably since the recession, averaging 0.7 percent per year from 2011 to 2017. That remains lower than the 2.7 percent annual growth rate average from 2000 to 2007.